Sand, water and Wedding cake. - You don't know me. And a preist attacking a woman... Odd. Unfortunately, by the time the relations between the bride and the groom were made clear, it was too late to stop the wedding... So the family decided to improvise. In the video they people seem to be speaking Spanish. I thought I heard the priest say to the women, "satan get out...go away go away!" Interesting. I wonder what happen before to get the woman all mad at the priest. I don't know. It's fascinating, though. "Some tiny pieces of sand dust from the Sahara desert may even be in your home." And the priest!? I have to admit, I LOL'd! mr. & mrs. smith renew their vows. Bristol and Levi's shotgun wedding. http://cakewrecks.blogspot.com this is hilarious...a great pick me up! LOL. Awesome. I love that. I totally just looked at liek 50 cakes and laughed sooo hard. Dr. Cox and Jordan's de-wedding cake. 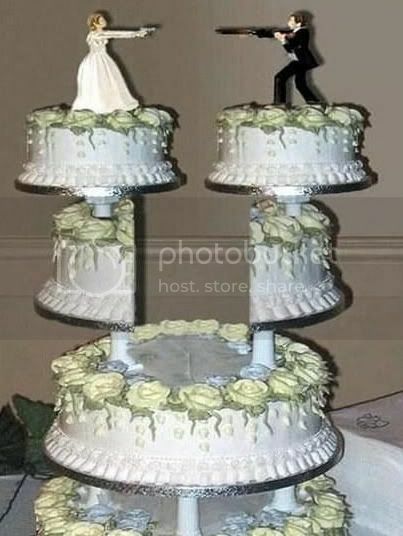 that is the best wedding cake EVER! Sign the Divorce papers or I'll shoot Mr Smith!